Hilton Head Island is the most popular vacation destination of the South Carolina lowcountry. It is acclaimed for gorgeous sand beaches, fun family resorts, a thriving cultural community, and iconic lighthouse. 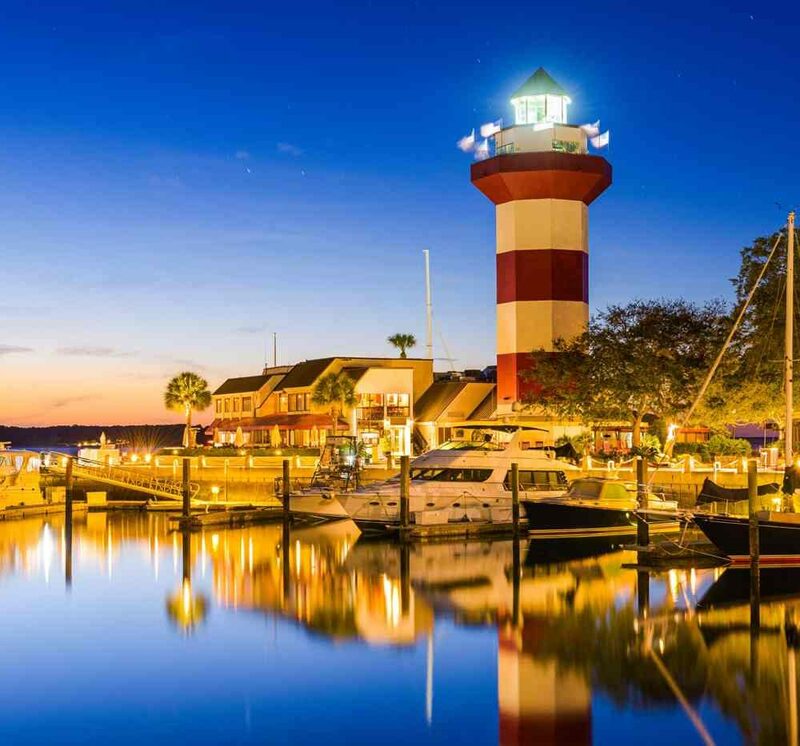 Hilton Head claims proximity to both Charleston and Savannah, making for a convenient summertime get-away. The island is situated off the coast of the southern tip of South Carolina. Twelve miles of sprawling beachfront accommodate multiple high-end resorts and gated plantations. The Sea Pines resort is the most notable. Luscious golf courses and conscientiously tended moss-draped oak trees attribute to the island’s exquisite greenscape. Hilton Head is the perfect place to come relax, be with family, and experience deep cultural roots in addition to unlimited outdoor activities. Hilton Head residents possess extensive community organizations for such a small island. The Arts Center of Coastal Carolina hosts a year-long schedule of events, festivals, art camps, and workshops, guaranteeing festivities for vacationers during any season. The Coastal Discovery Museum provides education on the rich history of the lowlands. You can also take a guided outdoor expedition and even touch one of the island’s trademark alligators. For music lovers, Hilton Head brags its own Symphony Orchestra and Choral Society. Hilton Head visitors embrace outdoor exercise. The island is equipped with a vast array of bike trails. Biking is one of the most convenient modes of transportation for locals and tourists alike. Additionally, the island is famous for its dozens of championship golf courses, many with beachside views. Other invigorating options include horseback riding on the beach, ocean kayaking, and hiking wildlife trails. Looking for a more relaxed vibe? Head to one of the beloved public beaches for sunbathing and exotic ocean sunsets. Hilton Head ranks as one of the top 10 family beaches in the United States. The island includes activities designed for all ages and resorts that cater specifically to groups and children. Hilton Head Island represents the most memorable family vacation destination.